The Blackmagic Design HyperDeck Studio 2 is a file-based deck that features the same functionality and control of professional tape decks. It records uncompressed video with 4:2:2 color sampling at 10-bit in Quicktime format, and also records video using either ProRes or DNxHD codecs. With two SSD slots, you can record almost endlessly as one SSD becomes full, recording automatically continues on to the other. The HyperDeck Studio features one 3G-SDI input and three SD/HD/3G-SDI outputs plus a loopthrough output, and one HDMI input and one HDMI output. 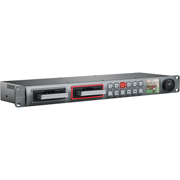 All outputs, except the loopthrough SDI, are always active, so playback is available on both the SDI and HDMI outputs no matter what input it was recorded from.